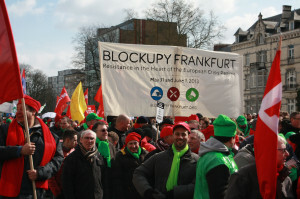 Come to Blockupy Frankfurt on May 31st and June 1st 2013! The so-called euro crisis is used by the financial and political elites to push a new wave of neoliberal reconstruction. In many countries there are mass lay-offs in the public sector. They increase the retirement age, cut unemployment insurance and continue privatization of public property. They reduce the minimum wages and weaken collectively bargained contracts and workers´ rights. In Greece they de facto annulled lay-off protection and the right to collective bargaining. They plan to reduce the wages until the country´s “competitiveness” is reestablished. Their cuts destroyed the health system. Neoliberal austerity politics scheme to overcome the crisis by impoverishing the European South and pushing for a new wave of social and wage dumping throughout the EU. The German Agenda 2010 was declared the “blueprint” (Merkel) for reducing wages and welfare and for privatizations in all of Europe. This is also an attack on our rights as employees and unionists here in Germany! Through cost-reductions in companies, debt-ceilings and foreseeable cuts in public spending they try to increase the pressure on wages, working conditions and public welfare also in this country. We have long known that the bail-outs only save the banks and not the people of Southern Europe. We know that the means of the ESM are only directed at maintaining states´ solvency for public debt, while the power of the wealthy of the financial markets remains unchallenged. We also know that there have not been any significant shifts in economic policy and the wealth of a few continues to grow while living conditions for millions deteriorate and public debt skyrockets. To change this, people are going on strike and demonstrate throughout Europe. To change this, they create spaces on public squares, in companies, in unions´ houses and universities to discuss alternatives. They practice inclusive and hands-on solidarity and are striving to develop shared perspectives of solidarity for all. This is what we need to stop the neoliberal landslide and to develop alternatives! We stand in practical solidarity with them! We also stand with employees in the trade sector, where employers terminated all collectively bargained contracts and aim for a massive deterioration of employment and wage conditions. We stand with the millions of subcontract and migrant workers who fight for their survival by working in dumping-jobs for example at Amazon or in other workplaces in the huge European low-wage sector. We stand with the employees in the public sector like the teachers and education workers who are righteously struggling for better pay in the collective bargaining processes that are taking place in this very moment. We say NO to the crisis politics of the German government and the Troika! We say NO to a Europe of the banks and corporations! We call on you to join the protests against the crisis that are planned in Germany: Come to Blockupy Frankfurt on May 31st and June 1st 2013!